I mentioned it in one of my last posts of 2009: Santa brought the girls a real sewing machine - the Janome Sew Mini. At first I felt a little nervous about it. I wasn't sure they would like it. And given their young age (9 and 6), would it be easy enough to operate? I was a bit worried too - was I putting pressure on them to like the same thing I like to do: sewing? Turns out that I worried too much. They just love their little sewing machine, the best proof being the little projects they did. So far, they each made a heat therapy cherry pit pillow. Big girl M. made the most gorgeous tote, big enough to fit a large sized book in it. And they both made a little linen pouch for their cousins, with their cousins' names embroidered on it - too bad I didn't have time to take pictures as these were REALLY cute. For all of these projects, all I did was provide the fabric, cut the fabric and put the pieces together ready to be stitched on the machine. Since the bag turned out so lovely and is really easy to make, I decided I might as well provide you with some instructions. My first tutorial for 2010! 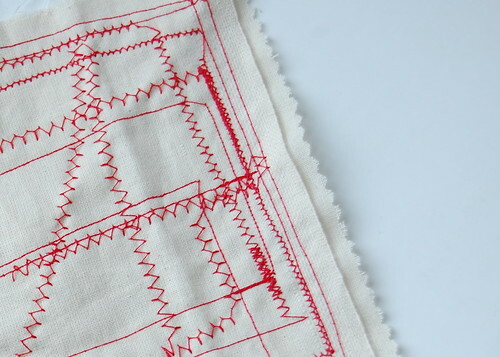 It makes a nice beginner's project, not just for kids but for anyone who's new at sewing. 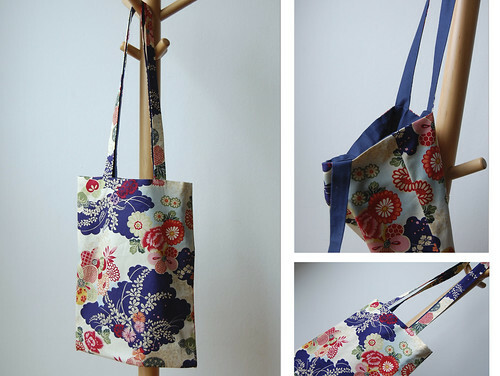 All you need is two rectangular pieces of fabric of 42 by 80 cm, one for the outside of the bag and one for lining the bag and some matching thread. 1. 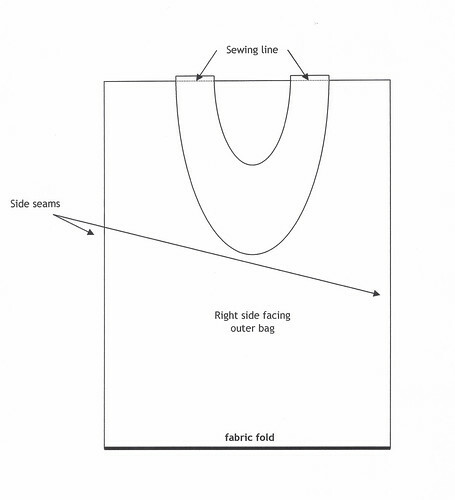 Cut the fabric - both the lining and outer fabric - as shown in the diagram. 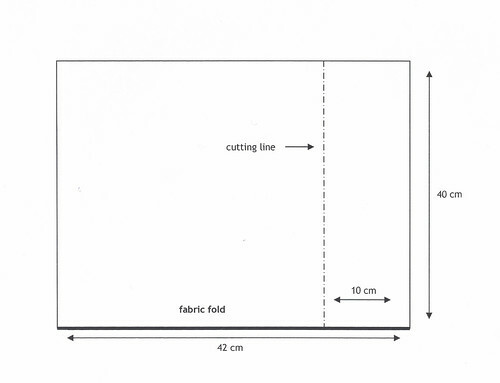 Next, fold the 10cm wide strip in half, lengthwise, and cut lengthwise at the fold so you obtain two 5 by 80cm strips. These will be used for the handles. 2. Starting with the outer fabric, fold the bigger piece in half, right sides facing and stitch the side seams. Repeat with the lining, but this time you leave a small opening in one of the side seams, for turning. 3. Take one of each fabrics long handle strips, place on top of each other right sides facing. Stitch both side seams. Attach a safety pin at one end, slip it inside and turn the obtained tube inside out - this makes a nice exercise in fine motor skills for kids. Remove the safety pin. Shape the handle and press flat with an iron (this should be done by an adult). Repeat with the other set of strips. 4. Turn the outer bag inside out, if you haven't done so already and pin the handles to the bag, such that the outer fabric of both the handle and bag is facing. Stitch into place, really close to the edge. 5. Pull the lining over the outer bag with the handles already attached, making sure the handles are squeezed inside, and such that the right side of the outer bag is facing the right side of the lining. Stitch the top seam, about 1.5cm from the edge. 6. Now, turn inside out the bag through the opening you left in the lining. Shape and press flat with an iron (adult!). Close the opening in the side seam of the lining and ... done! I hope this is clear - if not just let me know! Just a final note: if you plan on doing this project with kids, or any project on the sewing machine, do not leave them unattended while operating a sewing machine and make sure to keep the working area safe! And now I'm off to dismantle and get rid of our Christmas tree! Wishing you a fun first week of the new year!